Our cats are the loves of our lives. We love their jellybean toes, their sweet little noses. We love when they rub against us, nudging our arms with their soft faces asking for pats. Even when they meow for breakfast, or swat at overstayed bellyrubs, we adore our kitties. Still, most of us have lives outside of our cats: jobs, day-trips, vacations. We all feel the same pang of guilt leaving our precious kitties at home alone, the same longing to give them all of our snuggles and love. Well, we have good news! Don’t let distance get in the way of your love: here are 10 life hacks to care for your cat while you’re on-the-go! When you’re away you can’t make sure you cat has access to water. Cats are already prone to dehydration, and when they get finicky or stressed they’ll reject food and water as an act of mini-rebellion. Make sure your cat stays hydrated while you’re out by investing in a cat drinking fountain. Entice your cat with the soothing running water of the cat drinking fountain. Cats are drawn to running water because, primally, running water indicates clean water while stagnant water indicates dirty water. Cat drinking fountains keep the water clean, fresh, and circulated, so your feline friend will never turn his nose-up at a bowl of water again! If you bring you kitty-cat companion with you when you travel, be sure to practice with the cat-carrier before you make long trips or extended trips. 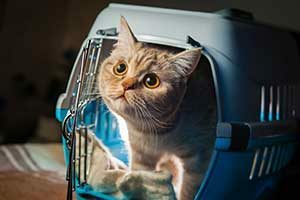 Cats hate confined spaces, and the carrier to them means, “I’m Trapped!” Cats are known to freak-out in cat carriers, becoming aggressive and stressed. Cats coping with the stress of the cat carrier will lash out, or go to the bathroom in the carrier. To get your cat used to the carrier so you can travel with ease, and your cat can travel in comfort, be sure to practice with the carrier. 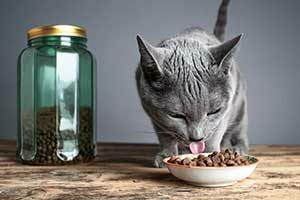 Put your cat in the carrier and go on short 10-20 minutes drives that end with a reward of their favorite treat! Be sure to include a favorite toy or blanket to go in the carrier with them so that way the carrier smells, and feels, familiar. When your cat only associates the carrier with long-term confinement or trips to the vet, the carrier becomes a negative space. Practice short trips with the carrier that instill a positive predisposition to travel. When you’re away, your cat misses you as much as you miss them. When you’re gone, your cat may become stressed, lonely, or even depressed. Leave unwashed clothes on the couch, bed, or floor, for your kitty. Your kitty will love rolling around in your clothes and lying in your scent. Your smell will comfort your kitty, and reassure them that you will be back soon! To provide your cat with happy stimulation, be sure to keep the blinds opened (and the windows secure) so your cat can worldwatch to their heart’s content. If your cat doesn’t have easy access to a window, think of investing in a window perch so your kitty has a dedicated space to relax and watch the birds. A stimulated cat is a happy cat! Keep your cat from being bored and more aware of your absence by distracting them with window entertainment. For cheap, destroyable toys for your cat, give them empty tissue boxes and toilet paper rolls. These cardboard toys are a perfect outlet for stress or anxiety, so when you get home you simply have to clean-up a shredded tissue box rather than a shredded couch cushion! To keep your cat off certain surfaces, use double-sided tape. Cats hate the sensation of having tape stuck to their paws, so when they jump onto the kitchen counter while you’re away they’ll get a harmless surprise! Apply double sided tape to any furniture or surface to establish a cat-off zone. This can protect your furniture from being scratched, damaged, or soiled, when your cat has free-reign of your home for extended periods of time. When you’re away, your cat is already dealing with anxiety and stress: when you add overeating to that situation, you’re asking for disaster! Cats that overeat, or eat too fast, will experience tummy troubles that may result in diarrhea or vomiting. There’s little worse than returning home from a long day’s work and finding hours-old diarrhea on your couch. Leave food for your cat on a shallow plate. The shallow plate spreads the food out so your cat can only get small, modest bites, encouraging them to eat more slowly and deliberately. When you’re on-the-go, you may forget to change the kitty litter or you may leave the kitty litter for longer. To safely minimize the strength of odors, sprinkle green tea leaves in your cat’s kitty litter. This will keep the litterbox smelling fresher for longer! The constant sound of conversation coming from the tv will soothe your cat, while the colorful action will entertain. Whether it is an engaging animal program that will grab your cat’s attention, or daytime talk-shows that will drone and calm, the television can prevent your cat from feeling lonely, stressed, or bored. We offer some of the greatest, most caring, pet services in Northern Virginia. We’re locally owned, so you know the sitter caring for your loved cat is going to personally care for, and tend to, all of your cat’s needs. We can come during the work day for short visits to check-in on your cat. We’ll play with them and give them a good dose of attention to get them through the rest of the day until you get home. For extended absences, we can visit your home for longer periods of time where we really play and care for your cat: playing, feeding, cleaning litterboxes, running any necessary cat-related errands, and administering any medications. We even offer overnight stays at our pet sitters’ home: one of our pet sitters will invite your cat into their home and family, caring for them 24/7 while you’re away.